For the last three years, Eastern Bluebirds have successfully nested in the preserves. The story began with a "Peterson" next box generously donated by the McHenry County Audubon Society. It is an ideal design for attracting Eastern Bluebirds. Preserve Steward Gary Morrissey and Birding Docent Jeff Wade first put the box up May 27, 2016. Within FIVE Days, an Eastern Bluebird couple had started building a nest. Each following year, Gary and Jeff have observed the couple busily flying in and out of the box during May, June and July. Throughout each year's brooding period, both parents actively fed their babies, guarded the nest and – when the time was right – encouraged the brood to leave the box. Eastern Bluebirds prefer meadows, large lawns, cemeteries, orchards, roadsides, and areas with scattered trees and short ground cover. Areas with fence lines, some medium size trees, or telephone lines provide perches for hunting and nest-guarding. While our preserve has most of these features, it also harbors dangers. 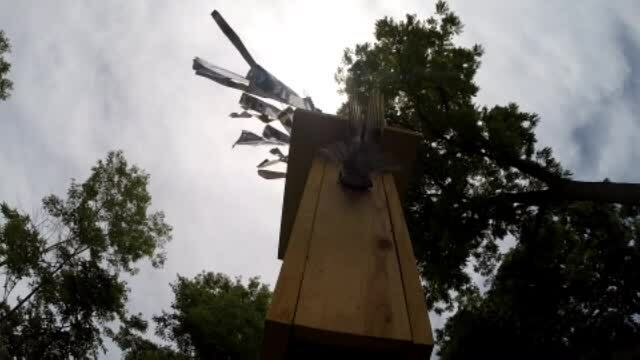 The installed “Sparrow Spookers” and “Baffle” helps keep snakes, squirrels, raccoons and other birds at bay. Nevertheless, the 2017 bluebirds had to overcome all sorts of predators: Kestrels, House Wrens, and yes, even humans. In March their bird house was tagged with graffiti. And in May the coupe was briefly evicted by House Wrens (also cavity nesters looking for a home). Our couple muscled up and took the box back! Needless to say, we have had tremendous success with three fledges in 2016 and four in 2017. This year's family laid five eggs, of which four hatched and at least three fledged. See the 2018 nesting photos and observation log below. May 4: The female is observed departing the box and also making MANY trips into the box with nesting material. A check of the box revealed the beginnings of construction. Bluebirds use grasses almost exclusively. June 7: The nest was completed. June 3: Five eggs appeared in the nest. June 15 -26: The four Bluebird hatchlings grew rapidly. July 7 - 10: The fledglings left the nest.